Taupō was the name of the land block, the stream and the main Ngāti Toa Rangatira settlement, which extended along the shoreline here. In 1846, the Crown took the great Ngāti Toa Rangatira leader, Te Rauparaha, prisoner from this settlement. The Taupō land block originally extended from Tawhiti Kuri to Haukōpua East and included the flax swamp. It was one of the places the Ngāti Toa Rangatira people settled after spreading out from their Kapiti stronghold once they had dominated the territory, winning the last major battle against local iwi in 1824. From at least the 1830s up until 1846, the Māori settlement at what is now Plimmerton was a principal kāinga/village of the great leader of the Ngāti Toa Rangatira iwi, Te Rauparaha, and therefore a centre of Ngāti Toa Rangatira influence. The hereditary leader of the iwi, Te Hiko o Te Rangi, (acknowledged by Te Rauparaha as the original owner of this area) was also based here. The land at Taupō was highly desirable for garden cultivations and the sea had a great variety and an abundance of kai moana (seafood). Located midway between the Taupō swamp and the water’s edge, it was a perfect place for trading flax from the swamp for muskets and other European goods, and was an ideal crossing point between the north and south islands. Settlements on this part of the Taupō block at Plimmerton are thought to have stretched from the shelter of the hill opposite the current railway crossing, along the beachfront including the current site of the railway station, and around past the point where the Fire Station and Pavilion stand today. In June 1839, Wesleyan missionaries, Bumby and Hobbs, met with Te Rauparaha in his whare on Mana Island. It seems likely that Te Rauparaha would have had a similar (or larger) whare at Taupō, which was on the mainland and described as his kāinga whereas Mana Island was described as Te Rangihaeata’s. As a domestic kāinga it was, at least initially, unfortified. 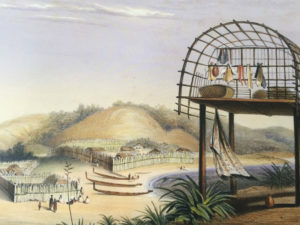 In one of the illustrations, Taupō Village is shown as a kāinga in 1843. The wāhi tapu where Te Hiko o Te Rangi was later buried is in the foreground above Te Rangihaeata’s future fortified pā area. In the distance (around the current Ngāti Toa Domain) can be seen Thom’s Whaling Station, with Nohorua’s settlement, Paremata Pā, sited alongside. The scene in another of the illustrations was drawn two years after the earlier image of the same settlement (and printed in 1847). By then Taupō was clearly palisaded, the fortifications probably added as the result of land dispute tension, at the same time as Te Rangihaeata was establishing his fortified pā. 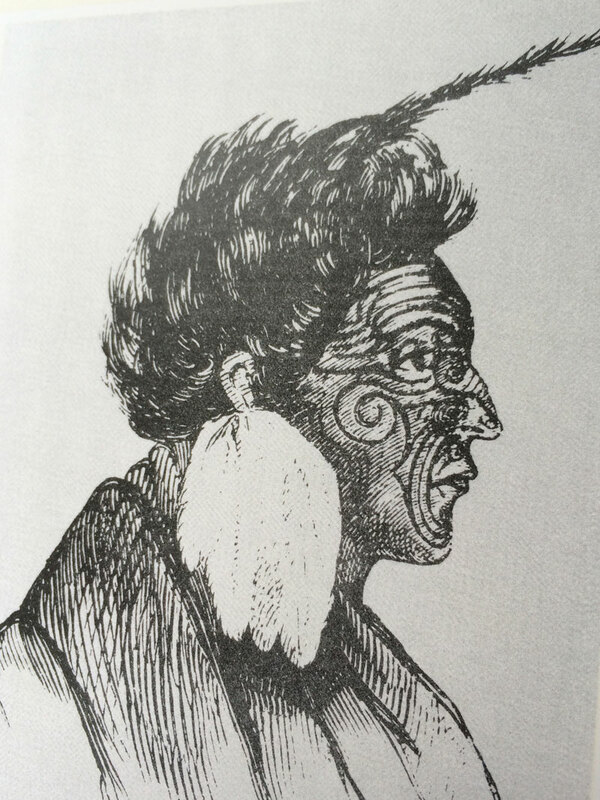 In June 1843, Reverend Ironside recorded in his journal that Rawiri Puaha took his followers from Cloudy Bay and Port Underwood in the South Island to Taupō. Puaha had converted to Christianity and the Taupō village became the centre for missionary work in the area. In 1845, Ironside and his fellow Wesleyan missionary James Watkin held a major hui here, and in 1848 a chapel was erected at the cost of £3. It was here that British troops, armed police and seamen, acting under the orders of Governor Grey, landed from the government steamship HMS Driver at dawn on 23 July 1846, and seized Te Rauparaha. Major Durie and Midshipman McKillop led the landing party of 200 men. Accounts of what happened vary according to different writers at the time. However, Governor Grey’s letter confirms those seized as Te Rauparaha, Hohepa Tamaihengia, Wiremu Te Kanae and two lesser chiefs. Te Rauparaha was held without trial for 18 months, first aboard HMS Calliope and then in Auckland. In April 1847, during the time of his captivity, other chiefs endeavouring to secure his release sold much of the Ngāti Toa Rangatira land to the Crown. Speculation and debate has continued about the actual site of Te Rauparaha’s whare from where he was seized. The view among Māori puts Te Rauparaha’s whare at the site of the tī kōuka (cabbage tree) now standing at the Te Rauparaha Reserve in Motuhara Road. The description, from the time of the capture, of soldiers running some distance to and through the village from the beach landing to the whare supports this view. The newspaper report of 1896 about the land sales auction at Plimmerton offers an alternative view. It describes the section No. 39 as having been auctioned for the highest price (£121) because of its historical significance as the site of Te Rauparaha’s capture. That section is on the south side of Beach Road, with the beach as the western boundary. 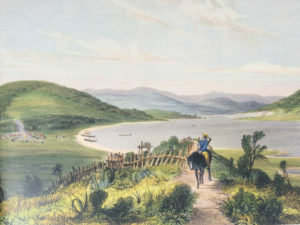 When Te Rauparaha was returned to Otaki on his release in January 1848, Taupo village gradually lost its pre-eminence to the settlements of Takapūwāhia and Te Uru Kohika. An 1850 survey showed the village as abandoned and noted that the people, and some of the building materials, had moved to Takapūwāhia. J H Bumby, Journal June – December 1839, Alexander Turnbull Library, Wellington.